Manchester-based jazz saxophonist Nat Birchall has come a long way since releasing his debut album The Sixth Sense in January 1999, and nowadays, is regarded as one of the leading lights of the vibrant British jazz scene. Nat Birchall is also one of the most talented and inventive British jazz saxophonists of his generation, whose playing is always soulful and spiritual. That has been the case on the nine albums that he’s released over the past three decades. This includes Nat Birchall’s most recent album Cosmic Language which was released by Jazzman Records. It’s the next chapter in the Nat Birchall story. The Nat Birchall story began in 1957 when he was born in a secluded rural idyll high in the hills above North-West England. This was where he was first heard music playing on his parents radio. By 1971, fourteen year old Nat Birchall bought his first single, which was Isaac Hayes’ Shaft. This wasn’t the start of a lifelong love affair with soul, and instead, Nat Birchall embraced reggae, especially roots and dub. Gradually, he amassed an enviable record collection, which although it mostly featured reggae, also included one jazz album. This was John Cotrane’s 1957 album Blue Train, which Nat Birchall rediscovered in a corner of his collection one day in 1979, and which inspired him to learn to play the saxophone. Fortunately, a record shop that Nat Birchall that was a regular visitor to, had an alto saxophone for sale, and he managed to persuade the shop owner to sell it for £20. Little did Nat Birchall that it was the best £20 he would ever spend. Although Nat Birchall was a late starter when it came to the saxophone, the twenty-two year old started taking lessons with local saxophonist Harold Salisbury who also had a passion for modern jazz. After each lesson, Harold Salisbury would hand his pupil a pile of albums and he would listen to in between practise sessions. After just a dozen lessons, Nat Birchall could already play the saxophone by ear and didn’t bother with another lesson until 1994. By the mid-eighties he was already a member of various fusion, jazz-funk and Turkish fusion bands. This was the equivalent to a musical apprenticeship for Nat Birchall, who by 1992, was ready to form his own band. This was Corner Crew, an innovative group who were formed in 1992 and incorporated a rapper and sampling as they played their own unique style of jazz-tinged hip hop. The new band proved popular and their live shows were well received. However, but after two years with Corner Crew Nat Birchall was ready to complete his musical education. In 1994, Nat Birchall enrolled onto a Higher National Diploma course in jazz studies, which allowed him to learn musical theory. Nat Birchall knew that he could only go so far in jazz playing by ear, so knuckled down and completed his musical education. This would prove important when Nat Birchall embarked upon the next chapter in his career. After six years leading Corner Crew, Nat Birchall was ready to try something different. He had taken Corner Crew as far as he could, and in 1998 the band split-up and later that year, Nat Birchall formed a new band whose roots were the hard bop…Sixth Sense. Later in 1998, the nascent Sixth Sense began recording a demo, and when Nat Birchall and those around him listened to the demo, they realised that it was good enough to release as an album. Rather than try to interest a record company in the album that became Sixth Sense, Nat Birchall decided to self-release his debut album. Only a small amount of Sixth Sense were pressed and released on Nat Birchall’s new label Sixth Sense on January the ‘9th’ 1999. However, Sixth Sense was released to critical acclaim and was one Jazzwise Magazine’s albums of 1999. By then, looked as if Nat Birchall had a bright future in front of him. Sadly, Nat Birchall’s band Sixth Sense only lasted a few years, and before long, he found himself looking for likeminded musicians. There was a problem though, the type of musicians Nat Birchall was looking for tended to gravitate towards London. Meanwhile, Nat Birchall was still living high in the hills of rural North West England which was, and still is, his spiritual home. Nat Birchall had not intention of leaving his home, so decided to wait until he connected with the right musicians. Eventually, Nat Birchall’s patience was rewarded when he met Matthew Halsall in early 2007. Here was the likeminded musician he had been looking for, and who would produce Nat Birchall’s 2009 sophomore Akhenaten which was released to plaudits and praise on Gondwana Records. A year later, and Nat Birchall returned in 2010 with his much-anticipated third album Guiding Spirit which was produced by Matthew Halsall and released by Gondwana Records. Just like his first two albums, Guiding Spirit was released to widespread critical acclaim. Nat Birchall’s star was in the ascendancy and he was regarded as one of British jazz’s rising stars. On the ‘22nd’ and ‘23rd’ of January 2011, Nat Birchall returned to the studio with his band and over a two-day period recorded his fourth studio album Sacred Dimension. Later, in 2011, Sacred Dimension was released by Gondwana Records and enjoyed the same critical acclaim as previous albums. By then, Nat Birchall’s music was already starting to find an international audience who embraced and enjoyed the saxophonist’s soulful, spiritual sound. Eighteen month later, Nat Birchall and Nat Birchall and a talented band of likeminded musicians headed to Peel Hall, in Salford on the ‘3rd’ and ‘4th’ of July 2012 where they recorded the seven tracks that became their first live album World Without Form. It was released on Nat Birchall’s Sound Soul and Spirit Records, and was a tantalising taste of Nat Birchall live. Ten months after the release of his first solo live album, the Nat Birchall Quintet headed to Larissa, in Greece, where they recorded their debut album Live In Larissa on the ‘11th’ and ’12th’ of May 2013. The following year, Live In Larissa was released as a two LP set by Sound Soul and Spirit Records and showcased the Nat Birchall Quintet in full flight. In October 2015, Nat Birchall returned with his fifth studio album Invocations, which was his sixth overall. Invocations which was an album of spiritual modal jazz, was the first album that Nat Birchall released on Jazzman Records. Critics hailed Invocations as one of Nat Birchall’s finest albums and noted the influence of jazz greats, John Coltrane, Pharoah Sanders and Albert Ayler. They had definitely influenced and inspired Nat Birchall as a new chapter in his career began. Just nine months later, Nat Birchall released his seventh solo album Creation on the ‘22nd’ July 2016. Creation was Nat Birchall’s second album for Jazzman Records and featured a much freer, but still soulful and spiritual sound. This found favour with critics who continued to lavish praise on the Manchester based jazz man, Nat Birchall. After the release of Creation, Nat Birchall continued to play live and was invited to play a concert at the Maharishi Golden Dome in Skelmersdale, which was a Transcendental Meditation centre in his native Lancashire. This was very different to the usual venues that Nat Birchall played. Nat Birchall realised this, and decided that when he played at the Maharishi Golden Dome he would need to take a band that was sympathetic to such a quiet-minded setting. That was when Nat Birchall remembered the harmonium that he had owned for many years. The small pump organ would be a perfect replacement for the piano when played at the Maharishi Golden Dome. That night, at the Maharishi Golden Dome, Nat Birchall and his usual band took a cross-cultural approach combining elements of jazz with Indian ragas. In doing so, he was following in the footsteps of two jazz greats Alice Coltrane and Yusef Lateef. The wistful harmonium was the perfect foil for the soulful, spiritual sound of Nat Birchall’s saxophone during a memorable performance and one that inspired Nat Birchall’s next album, Cosmic Language. On the ‘16th’ of December 2016, Nat Birchall and his band headed to Limefield Studio, in Manchester, where they would record the four tracks that became Cosmic Language. That day, the rhythm section of drummer and percussionist Andy Day and bassist Michael Bardon were joined by Adam Fairhall who played harmonium while Nat Birchall played tenor saxophone and percussion on spiritually cleansing album. Cosmic Language opens with Man From Varanasi where Nat Birchall pays homage to one of his favourite Indian musicians, Bismillah Khan. He hails from then Northern Indian city that is named in the opening track which is an eleven minute epic that has been inspired by the Indian raga tradition. This was also a basis for much of Bismillah Khan’s music. Here, Nat Birchall’s slow, sultry and soulful sounding saxophone soars above the understated and initially percussive arrangement and soon, it veers between melodic, memorable and spiritual to a much freer sound as the tempo increases. Meanwhile, just a melancholy, droning harmonium, shimmering cymbals, standup bass and drums augment the saxophone. Later, when the saxophone drops out, the rest of the band take centre-stage as this clearly defined musical journey continues. Then when Nat Birchall’s saxophone returns, his playing is still soulful and has the spiritual sound that has been omnipresent throughout this beautiful meditative track. Initially, Nat Birchall and his band plays slowly and within himself as Humility gradually unfolds. What follows is akin to a spiritual experience as waves and washes of soul-baring music unfold. At one point when the saxophone drops out, the arrangement is almost stripped bare, allowing time to ruminate and reflect on humility. When Nat Birchall returns, his playing is even more soulful and spiritual as if he’s in the midst experienced some sort of spiritual awakening. This spiritual quality continues on A Prayer For which is a captivating combination of Indian ragas and jazz which is a step further along the road to musical enlightenment. Cosmic Language closes with Dervish where a wheezing harmonium, percussion and rhythm section provide the backdrop for Nat Birchall’s tenor saxophone. Soon, he’s variously playing with speed, power, passion, fluidity and freedom as if he’s reached musical enlightenment on this spiritual during this epic album. Although Nat Birchall never released his debut album The Sixth Sense until he was forty-two, he’s come a long way since then. Nowadays, Nat Birchall is one of Britain’s top jazz musicians, whose album have received critical acclaim in different parts of the world. However, Cosmic Language which was recently released by Jazzman Records, and is Nat Birchall’s eighth solo album is the best of his career. 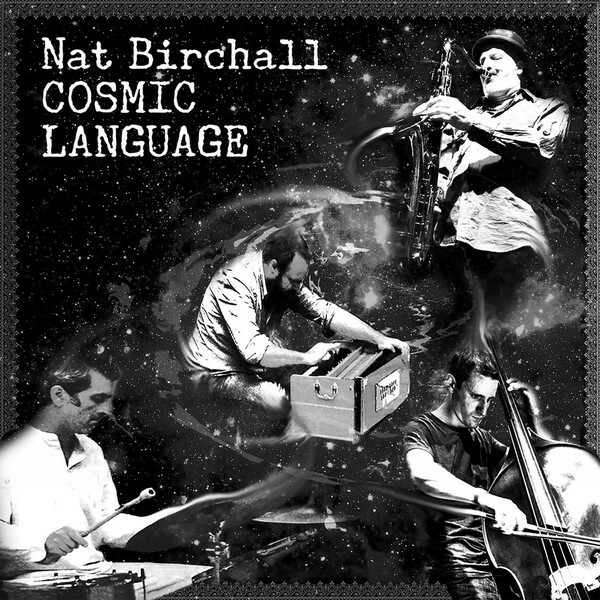 Cosmic Language features Nat Birchall at his most soulful and spiritual as this inventive and innovative musician embarks upon a spiritual voyage of discovery. The starting point for this was the concert at the Maharishi Golden Dome which is a Transcendental Meditation centre in his native Lancashire. That was where this spiritual journey began, and lead to Cosmic Language which was akin to spiritual awakening for Nat Birchall. Over four tracks lasting thirty-six minutes Nat Birchall combines Indian ragas and jazz on cross-cultural, genre-melting album. Nat Birchall gives something of himself on each of the four tracks on Cosmic Language which is his most personal album yet. It’s as if he was seeking enlightenment as he delivers soul-baring and heartfelt performances where Nat Birchall seamlessly combines Indian ragas and jazz on album that features Nat Birchall at his most soulful and spiritual. However, that is only part of the story of Cosmic Language. Unlike many musicians, Nat Birchall is a quiet and unassuming man, who shies away from the limelight and prefers to let his music take centre-stage. That is the case on Cosmic Language as he journeys towards spiritual communion. This is something relatively few musicians ever achieve, but Nat Birchall follows in the footsteps of Alice and John Coltrane, Pharaoh Sanders and Yusef Lateef on Cosmic Language. It features beautiful, powerful, poignant, meditative and ruminative music that allows and encourages the listener to reflect during Cosmic Language, as Nat Birchall takes the listener on a soulful and spiritual journey on during this career-defining opus. ← SPIRITUAL JAZZ VOLUME 8 JAPAN: PARTS 1 AND 2.